3. It doesn’t feel like a financial risk when the market for transactions is so limited: The market for longevity risk is different to a lot of financial markets in that it is illiquid and subject to significant transactions costs, meaning that the concept of marking-to-market does not exist in the same way. These issues combine to mean that representing longevity risk alongside asset-side risks in terms of a one year tracking error is a bit unsatisfying and probably not the most suitable framework in which to asses the risk. Nevertheless, to be consistent with other risks in the portfolio this approach is often adopted. The question is, what next? Most of the analyses I have seen conclude that longevity risk when represented as an annualized tracking error on the whole liabilities is of the order of 3-5%p.a. The beauty of diversification then means that when a low (or zero) correlation is assumed with the other financial risks in the portfolio, the conclusion is that the overall effect on the pension scheme’s risk position of removing longevity risk is not substantial. 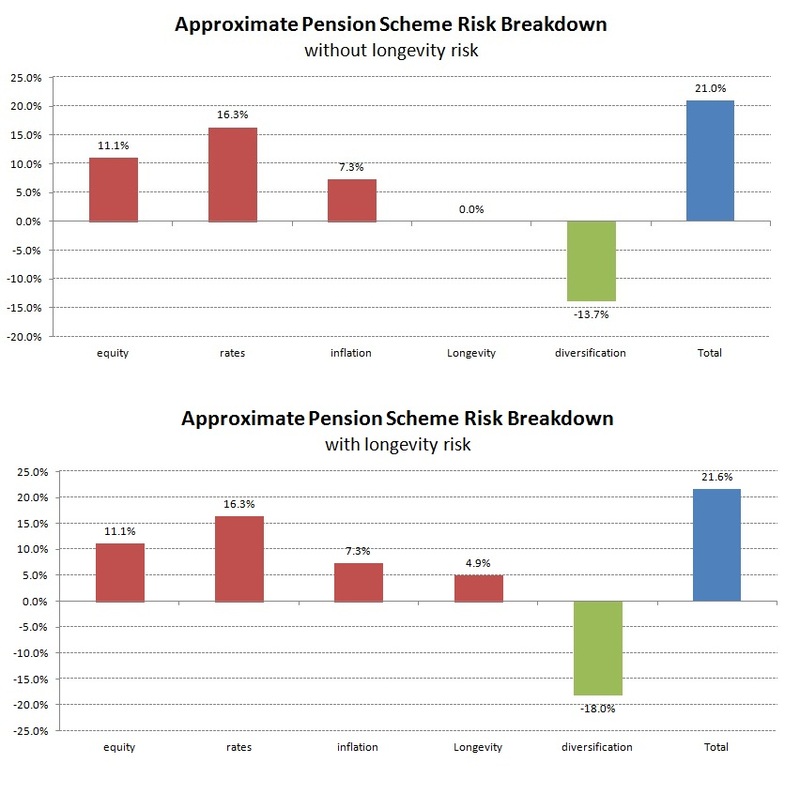 Add to this the fact that the most readily available longevity hedging solutions can only tackle pensioners and older deferred members and the conclusion starts to emerge that focusing on longevity risk doesn’t “move the dial” in terms of a schemes overall risk, this is assuming that a substantial amount of interest rate and financial market risks remain in the pension scheme as illustrated for a sample pension scheme below. 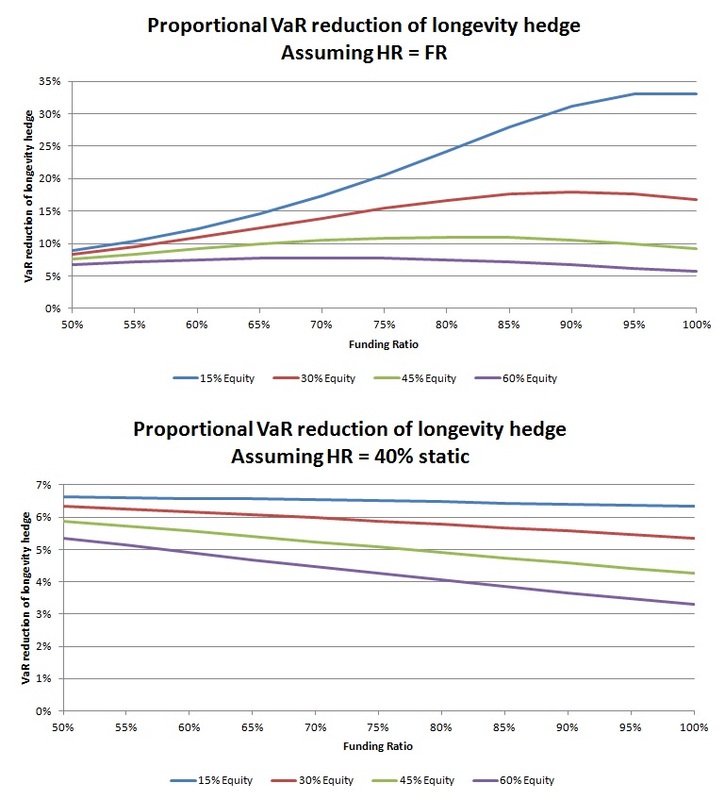 Given that longevity hedging is generally only available on the pensioner population and older deferred members, this means that, most ALM models will give the result that for schemes in the above situation, transacting a longevity swap will not meaningfully impact their overall risk position. Many pension schemes in this situation then might adopt the approach of reserving, and by this I mean setting their investment strategy to target a level of expected return slightly above that which they need to meet their funding goals. What is this level ? Achieving either of these increased return targets would clearly require changing the investment strategy to incorporate higher return (and hence higher risk) assets, the quantum of change would be non-trivial but achievable (for example moving roughly 10% of a scheme’s total assets from investment grade corporate bonds into equities, or lower quality and less liquid forms of debt would achieve a 0.2% p.a. increase in return). Year on year changes in realised improvements are volatile, but have ranged between 1% and 5% over the last decade. clearly reserving for a situation where improvements continue at the upper end of this band is unrealistic (better to hedge, which can be done well below this level). Beyond this its really hard to find sensible adverse scenarios to put a number on the level which long term longevity improvements will tail off to in the long term. The Actuarial profession published a paper reviewing assumptions across countries, and although the approaches differ substantially (and most countries do not use a model approach that explicitly calibrates the long-term rate of improvement as a parameter) the paper illustrates that there was an implicit assumption adopted regarding longevity improvements since the previous version of this work in 2005, and this varied between 1 and 2.5% p.a. What I have done below is run a very simplified* ALM analysis for a pension scheme over many different funding levels and asset allocations. Longevity is assumed to carry a 1 year 95% VaR of 5% and have zero correlation with other risks in the portfolio. I have illustrated the relative risk reduction (ie, the fraction of the total risk that is removed) by hedging longevity at various funding levels, hedge ratios, and allocations to risky assets. 1. Unless the scheme’s hedge ratio is maintained at or close to the funding level, removing longevity is unlikley to remove a large part of the overall risk- better concentrate on hedging interest rate and inflation risks first.